Families who want a reliable family sedan with a bold splash of color will want to explore Watermark Toyota’s selection of new red Camry models. The Camry family of vehicles includes features that enhance its positive reputation, and Edmunds has taken note. They write, “Toyota’s midsize mainstay should continue to please consumers looking for a roomy, well-rounded sedan that comes with a strong reputation for reliability and durability.” Now you can have this fun-to-drive sedan in an equally exciting color. 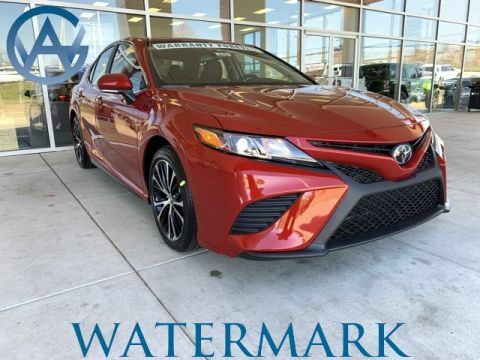 Watermark Toyota is pleased to offer a wide selection of Camry models to the good people of Madisonville and Bowling Green, so check out your options today. Why Purchase a New Red Toyota Camry at Watermark Toyota? One of the main reasons our customers keep coming back to Watermark Toyota is our exclusive Watermark Warranty. It adds extra protection on top of the Camry’s manufacturer warranty, and if you do need service in the future, our dedicated service team is able to take care of any issues you might encounter. Before you stop by to see the Camry in person, make sure to apply for financing and secure a low interest rate. Schedule a test drive online then visit our showroom at 1055 Crossing Place in Madisonville, KY.